Most Vintage Trailers never even GET listed here before finding a new home!! So call 949-689-3964 for the latest inventory! Sorry, all props / decorations NOT included with trailers. 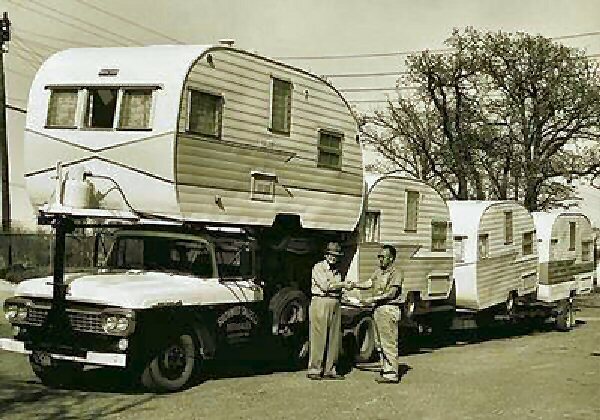 Don't forget to visit all 17 pages of Vintage Trailers / Vintage Airstreams!! And ask about our "Layaway" and "Right of First Refusal" finance plans! Experts in ALL trailer transporting nationally. Will GUARANTEE pickup ANYWHERE in the country within 7 days of payment!! We have negotiated special Vintage Trailer pricing with the owner, Ty Leckner. He wants to be called DIRECT on his cell phone at (703)407-8287 or email ty@showroomtransport.com. His company is also bonded and insured for your piece of mind!! Please tell him that Dayton Taylor of http://www.VintageTrailerCrazy.com/ has sent you for the discounted Vintage Trailer price. And, no, the above picture is obviously not really his rig!! Go to www.uship.com and fill out the forms. Uship puts your job order up and the transporters then bid for the work and contact you!!! This puts you in the "driver's seat" (I love puns) and you pick and choose your transporter. "Google on down the highway" and see what you find! Let your Dreams become a Reality!